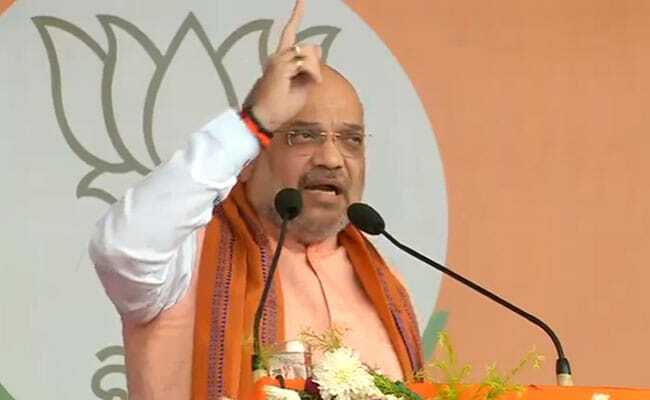 Giving credit to the BJP-led NDA government for stopping Rohingyas from sneaking into the country, BJP president Amit Shah Wednesday said the Modi government would throw all infiltrators out the country before the end of the second term of the Modi government. Mr Shah made the claim, while dubbing illegal immigrants as "termites" for the country. He also blamed former Prime Minister Jawahar Lal Nehru and the Congress for including Article 370 in the Constitution which provides special status to Jammu and Kashmir and for yielding a major area of the state to Pakistan. "The biggest work done by the BJP government was ending infiltration of the Rohingyas into the country. The PDP welcomed Roghinyas (into the state). Tell me whether the infiltration of Rohingyas should stop or not," Mr Shah asked an election rally in this border town, close to the Line of Control in Rajouri district. He said the Union government would come up with a National Register of Citizens when Prime Minister Narendra Modi assumes office for the second term. The government "will pick up all illegal immigrants one by one and throw them out of the country before the completion of the next five years", he said. "The infiltrators are eating up the country like termites and want to change the demography of the Jammu region. I promise you as long as the BJP government will be in the office, we will not allow any demographic change in Jammu," said Mr Shah. This was the second election rally of the BJP president in Jammu region. Earlier in the day, he addressed an election rally in Udhampur district in support of Union Minister Jitendra Singh who is seeking re-election from there. Sunderbani is part of the Jammu parliamentary constituency where incumbent MP Jugal Kishore is locked in a multi-cornered contest. He said "Jammu and Kashmir is the crown of India and nobody can touch it". "The first BJP president Shyama Prasad Mukherjee sacrificed his life in the state. It is because of him and the sacrifices of our jawans that Jammu and Kashmir is the part of India," he said. "The BJP has made Kashmir an issue of the party since 1950 and its activists are ready to sacrifice their lives to save Kashmir and will not allow the Congress to play with their sacrifices," he added. Amid chants of ''jahan huwa balidan Mukherjee, woh Kashmir hamara hai'', Mr Shah asked people to raise their voices to make it reach the Pakistan-occupied Kashmir behind the nearby hills. Mr Shah said the wrong policies of Nehru and the Congress were to be blamed for the inclusion of Article 370 in the Constitution and a large area of the state turning into Pakistan-occupied Kashmir. The BJP president attacked Congress also for promising in its manifesto to amend the Armed Forces (Special Powers) Act. "The Congress is talking about dilution of the AFSPA to allow infiltrators to sneak into the country from there," he said pointing towards PoK beyond the hills and said "we did not quit from the state government to allow the dilution of the Act." Seeking people's support for the party candidates, Mr Shah minced no words to attack the National Conference, PDP and Congress leadership and said "Jammu and Ladakh faced discrimination and step-motherly treatment during the 70-year-rule of these parties." "Modi ensured development of Jammu. He ensured motherly treatment to different regions," he said, listing various projects undertaken in the state specially in Jammu and Ladakh regions besides the economic package announced for the PoK-displaced persons and west Pakistani refugees. He said the Centre spent over Rs 2.74 lakh core for the development of Jammu and Kashmir over the last five years. Praising the people residing in villages along the Line of Control and the International Border in the state, Mr Shah said, "It is unfortunate that the wails of these people did not reach the deaf ears of the Congress over the years. "We sanctioned construction of bunkers for the safety of the people and Prime Minister Modi is going to hand over these bunkers to the people in July after returning to the power," he added. "You are the real sons of the country because you are holding your ground in the face of Pakistani shelling and firing from across the border," he said.